Crystal Palace's revival in the Premier League under Alan Pardew continued against Leicester City as they secured victory thanks to Joe Ledley's goal. Palace midfielder Ledley headed in from a corner early in the second half. The Eagles have now won three out of their last four league games since Pardew took over as manager. David Nugent had earlier struck the bar with a header for Leicester, but the Foxes were unable to find an equaliser and remain bottom of the table. Pardew, who left Newcastle to take charge of Palace at the start of the year, has not lost an away game in all competitions since he replaced Neil Warnock in the dugout. This result put the Eagles six points clear of the relegation zone and while they are not safe yet, Palace supporters might start to look up the table rather than over their shoulders. Leicester's prospects look bleaker. The Foxes have been bottom of the Premier League since November, and unless results improve soon they may find themselves cut adrift. And with league matches against Arsenal, Everton and Manchester City in their next three it could be while before they taste victory again. The Foxes were comfortably the better side in the first half but they were unable show the ruthlessness required to finish off the chances they created. Leicester winger Riyad Mahrez burst into the penalty area just before the half-hour mark and his low angled shot was parried by Julian Speroni, with the stretching Esteban Cambiasso unable to get a touch on the rebound. Moments later, Nugent escaped his marker and met Mahrez's near post corner only to see his header strike the top-right corner of the crossbar. Jordon Mutch, on his full debut following his switch from QPR, was taken off by Pardew for Yaya Sanogo and the on-loan Arsenal forward soon rippled with side-netting with a shot. The Eagles then took the lead 10 minutes into the second half when Dwight Gayle's corner was headed back across goal by Brede Hangeland for Ledley to nod in from close range. Leicester had a great chance to equalise when Nugent broke into the box and cut the ball back for Cambiasso, but he tried to tee up Mahrez rather than shoot and Palace cleared the danger. Nigel Pearson's side had their chances in the remainder of the contest as Paul Konchesky fired wide while Jamie Vardy saw his header hooked off the line by Martin Kelly. Before the final whistle Pearson was knocked over on the touchline by James McArthur resulting a friendly exchange between the Foxes boss and Palace midfielder, before Pearson stopped the player returning to the pitch by grabbing his shirt. Leicester City boss Nigel Pearson: "It was a game that we had chances and to come away with nothing is quite tough for us. "We had plenty of good situations while Palace did not create too much. "It's frustrating we can't turn performances into results." Asked why he held McArthur back, Pearson added: "Because he said something to me. I don't have to reveal anything do I? I'm more than capable of looking after myself. "There's no problem with the player. He's a good player and a likeable lad." Crystal Palace manager Alan Pardew: "Nigel will be disappointed not get something out the game but it was a good away performance. "Leicester City have good players, their wide players certainly caused us problems. We should have seen the game out more comfortably. "I think the changes at half-time helped us, because Brede Hangeland came on and was a colossus at the back and he was significant for the goal." Leicester striker David Nugent, who has scored twice in the league this season, hit the bar with a header. Match ends, Leicester City 0, Crystal Palace 1. 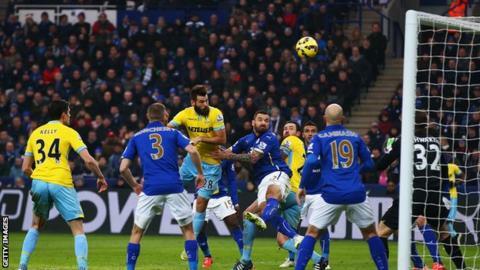 Second Half ends, Leicester City 0, Crystal Palace 1. Paul Konchesky (Leicester City) is shown the yellow card. Attempt missed. Yaya Sanogo (Crystal Palace) right footed shot from the centre of the box is too high. Marcin Wasilewski (Leicester City) wins a free kick in the defensive half. Dangerous play by Yaya Sanogo (Crystal Palace). Attempt blocked. Paul Konchesky (Leicester City) left footed shot from outside the box is blocked. Corner, Crystal Palace. Conceded by Marcin Wasilewski. Offside, Crystal Palace. Joe Ledley tries a through ball, but Yaya Sanogo is caught offside. Attempt blocked. Adlène Guédioura (Crystal Palace) left footed shot from the centre of the box is blocked. Assisted by Yaya Sanogo. Jason Puncheon (Crystal Palace) wins a free kick in the defensive half. Corner, Leicester City. Conceded by Julian Speroni. Attempt saved. Jamie Vardy (Leicester City) right footed shot from the right side of the box is saved in the top right corner. Attempt blocked. Riyad Mahrez (Leicester City) left footed shot from outside the box is blocked. Assisted by Matthew James. Attempt missed. Matthew James (Leicester City) right footed shot from outside the box misses to the left. Assisted by Esteban Cambiasso. Attempt missed. Matthew James (Leicester City) left footed shot from outside the box misses to the right. Attempt missed. Marc Albrighton (Leicester City) right footed shot from the right side of the box is high and wide to the right following a set piece situation. Attempt saved. Jamie Vardy (Leicester City) header from the right side of the six yard box is saved in the bottom right corner. Assisted by Riyad Mahrez with a cross. Marc Albrighton (Leicester City) wins a free kick on the right wing. Substitution, Leicester City. Jamie Vardy replaces Danny Simpson. Adlène Guédioura (Crystal Palace) wins a free kick in the defensive half. Substitution, Crystal Palace. Adlène Guédioura replaces Dwight Gayle. Attempt saved. Dwight Gayle (Crystal Palace) left footed shot from outside the box is saved in the centre of the goal. Substitution, Leicester City. Andrej Kramaric replaces David Nugent. Attempt missed. Jason Puncheon (Crystal Palace) left footed shot from outside the box is close, but misses to the left. Assisted by Brede Hangeland following a set piece situation. Yaya Sanogo (Crystal Palace) wins a free kick on the left wing. Corner, Crystal Palace. Conceded by Paul Konchesky. Substitution, Leicester City. Marc Albrighton replaces Jeffrey Schlupp. Foul by Yaya Sanogo (Crystal Palace).